At the risk of confirming all the stereotypes about the British, I am going to start yet another post with a complaint comment on the weather. The lovely warm, sunny weather that led to my last post on barbecued swordfish and halloumi skewers is now a distant memory and we have returned to grey, cold, wet, generally miserable weather. Boo. Will summer ever arrive?! One good thing about this however, is that it is a good excuse to bake a comforting, warming pie! Leeks are one of my favourite vegetables and, aside from sauteing them with butter, white wine and garlic, one of my favourite things to do with them is put them in a pie! 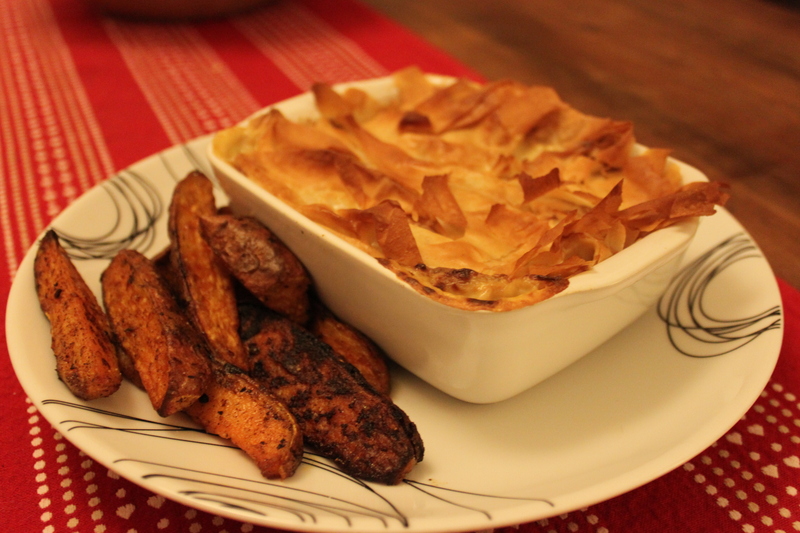 The recipe for these chicken and leek pies is based on a recipe from BBC Good Food. The sauce, made with cream cheese and dijon mustard, is creamy without being too cloying and tangy and tasty thanks to the mustard! These pies are topped with crispy crunchy filo pastry, which helps makes them a healthier option than a more traditional pie. You can also use low fat cream cheese to reduce the calorie and fat count even further – and it still tastes delicious, I promise! 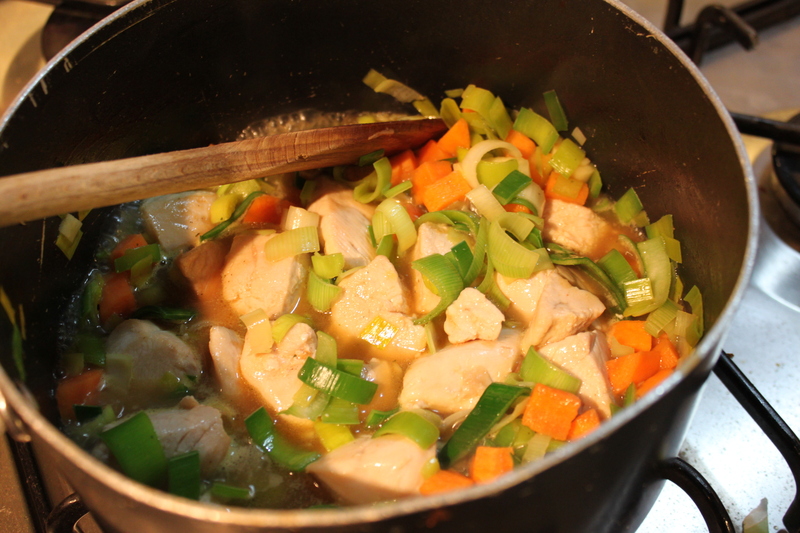 Pour a little oil into a pan and fry the cubed chicken until cooked, then remove from the pan and set aside. 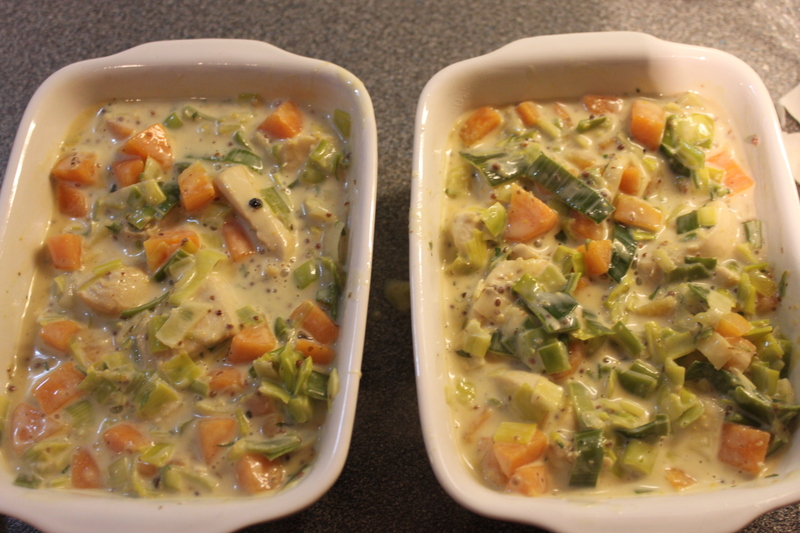 Add the chopped leeks, carrot and a splash of water and cook for around 10 minutes. Pour in the stock and bring to the boil until beginning to reduce then add the chicken to the pan and the mustard and soft cheese along with the finely chopped tarragon and some salt and black pepper. 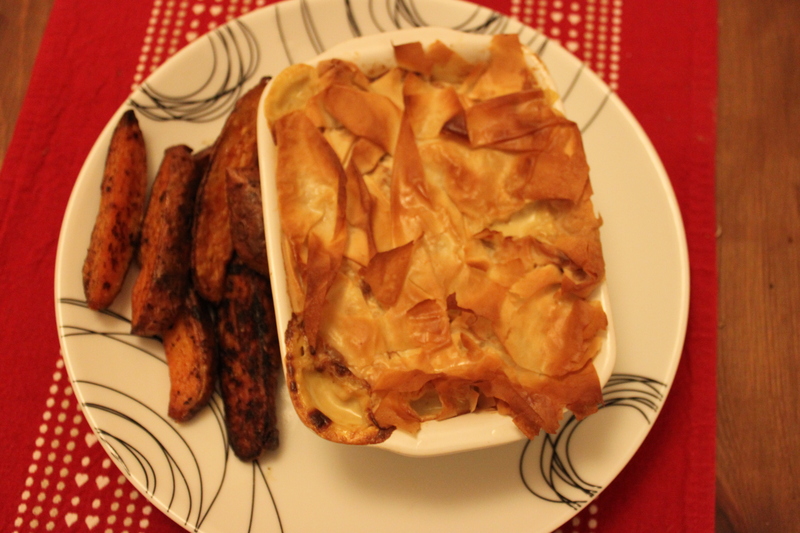 Divide the mixture between your pie dishes then scrunch up a sheet of filo pastry on top of each one. Brush with a little olive oil and pop in an oven heated to 200 degrees for 15 minutes. I like to serve these with some sweet potato wedges. These are good for dunking in the sauce!! Take one large sweet potato and chop into wedges. Parboil for a few minutes (not too long!) then toss with plenty of salt and olive oil before roasting for around 20 minutes. Mmmm!